Dr. David Gunn decided to pursue medicine after working with refugees from Afghanistan and witnessing the impact medical care can have. He attended the University of Oregon, where he earned a Bachelor of Science in Electronic Music, and also studied computer science and clarinet performance. He then earned a Masters of Fine Arts in Electronic Music and Recording Media at Mills College in Oakland, California (near San Francisco). After pursuing a technology career in Silicon Valley, Dr. Gunn returned to school to study medicine at the University of California, Davis. He completed his family medicine residency in Redding, California, and worked serving the medically underserved population of Shasta County at a Top 1% Federally Qualified Health Center. 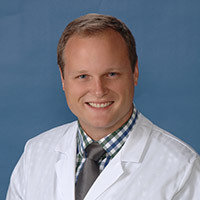 Proficient in Spanish, Dr. Gunn’s clinical interests include newborns and pediatric care, dermatology, and helping patients recover from addiction and dependency on prescription drugs. He is married to Dr. Nazanin Gunn, who practices in Thousand Oaks. Together they have a young twin boy and girl. His hobbies include learning Farsi and cooking.